Developing an attractive resume can be a time-consuming and expensive endeavor. 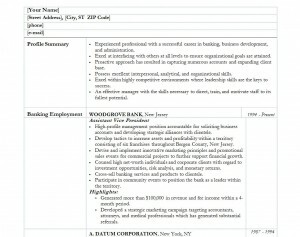 Using the free Banker Resume Template available on this site, on the other hand, is quick and simple. Follow the instructions below to create the perfect resume in no time. Get started by clicking the link below to download and save the template to your computer, then open the template in Microsoft Word. Follow the steps below to customize the template for your personal use. Click the [Your Name] field. Type your name. Click each of the remaining personal information fields and type in your street address, city, state, zip code, phone number, and email in the appropriate fields. Enter your professional career highlights in the Profile Summary section of the resume. Focus on the achievements relevant to the job for which you are applying. Note that these do not have to be in chronological order, so you should put your most impressive and applicable achievements first. Enter each employer and position you have held in the Banking Employment section of the Banker Resume Template. List each in reverse chronological order, starting with your most recent employer. It is important to use the correct formatting Styles when entering this information to maintain a clean and consistent look for your resume. Employers are in the Company style, cities are in the Location style, dates of employment are in the Dates + Before style, and position titles are in the Heading 3 style. Be sure to include highlights for each position. These showcase your talents and help make your application stand out from the crowd. Enter your degrees in the Education section of the Banker Resume Template. Enter each college you attended in reverse chronological order, with with the most recent appearing first. Again, it is important to be consistent with formatting Styles. In this section, each degree is in the Heading 4 style, the names of educational institutions are in the College style, dates of attendance are in the Date + Before style, and the city and state are in the Normal style. If you have any applicable certifications, list these in the Certifications section of the Banker Resume Template. Each certification should be listed on its own line, in the Normal formatting style. Be concise. Keep your resume as brief and to the point as possible. Put only the most applicable, important information and do not use more than two pages. Tailor your resume. Be sure your resume contains information targeted to the position.